In 1927 the Cristeros war started with the armed confrontation between the soldiers belonging to the Freemason government of President Elias Calles and the faithful Catholics who opposed it. Calles had outlawed the Catholic Church, rxiled the Bishops and clergy, and closed churches, schools and seminaries. He also had issued laws against landowners and peasants to claim rights to their properties. The whole country was in religious and social turmoil: battles, skirmishes and guerilla warfare were daily fare throughout Mexico. As the number of enlisted volunteers for the Cristeros grew and their support and power increased, the government retaliated however it could. 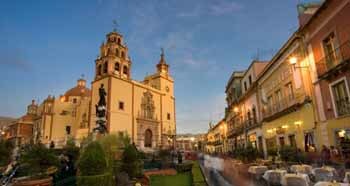 At that time Guanajuato was already one of the most beautiful and richest cities in central Mexico, due to its wealthy silver mines. A grandiose monument in honor of Christ the King had been built in bygone times to honor the main devotion of that Catholic State, also named Guanajuato. This area was an important center of Cristero resistance. The government ordered an air raid to target the monument dedicated to Cristo Rey and it was bombed. The statue of Christ the King was destroyed, but its heart and head were miraculously preserved. The heart and head of Catholic Mexicans was also preserved. The war ended, but their devotion was not destroyed. A shrine and another statue of Cristo Rey were built. 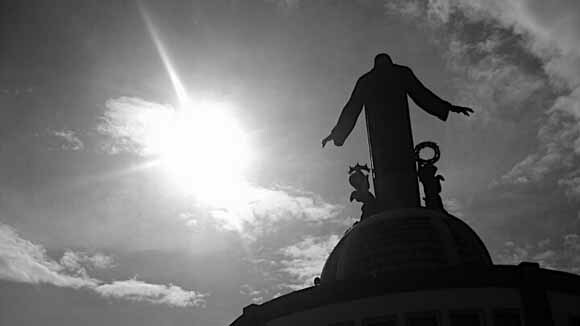 The new statue, like the old one, crowns Cubilete Mountain (8,500 feet), the symbolic heart and geographical center of Mexico. In front of the art deco shrine is a large plaza lined by columns that was erected in 1944 to replace the ormer smaller one that used to be there. 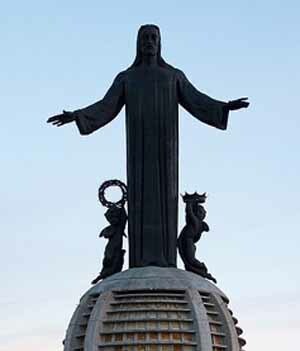 Atop the globe-shaped cupola is a majestic statue of Our Lord with his arms opened in a gesture of affection and hospitality. Soon after its completion, pilgrimages again began to that place so rich in symbolism and history. As one recalls, the devotion to Cristo Rey was the primary devotion of the Cristeros, along with that of Our Lady of Guadalupe. Their rally cry was Viva Cristo Rey! Their special hymn repeated this salute several times. No wonder Calles wanted to destroy the symbol of that devotion. No wonder that the shrine honoring Christ the King continued to attract the multitudes, even after the war. Indeed, from all over the State of Guanajuato, the survivors of the Cristeros epopee and their sons and grandsons mounted horses and rode to the shrine of Cristo Rey in Guanajuato to adore Our Lord, ask for special graces and etch more firmly in their souls memories of that glorious past. They chose the date of Epiphany to make their pilgrimage to pay that homage. Nothing could be more appropriate, since this is this day the Catholic Church commemorates the Three Kings who traveled to Bethlehem to acknowledge the Kingship of the Divine Infant in the Manger. In this respect, the journey of the pilgrim riders marks another feast of Christ the King. 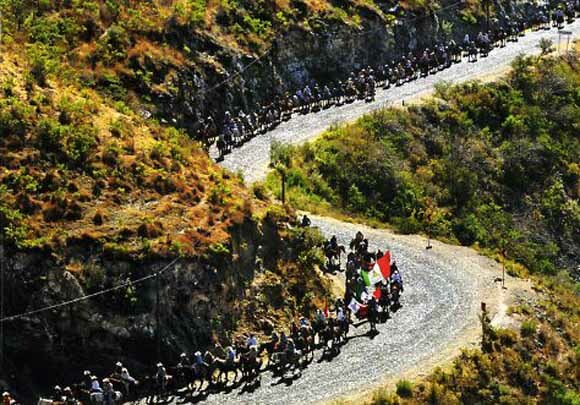 This movement of Mexican men riding their horses to the shrine of Cristo Rey is called the cabalgata of Guanajuato. 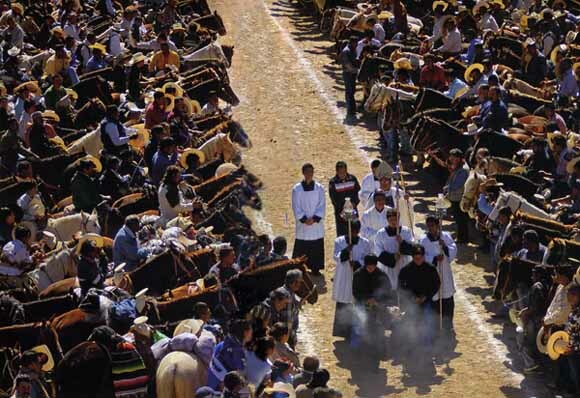 It is a mixture of a pilgrimage and a procession on horseback that ends at the foothill of the Cubilete. There, in a solemn ceremony, the riders receive a special blessing during an outdoor Mass. After the Mass, the pilgrim riders rest, don clean clothes, and then ride up the mountain individually or in small groups to venerate the famous statue of Christ the King. 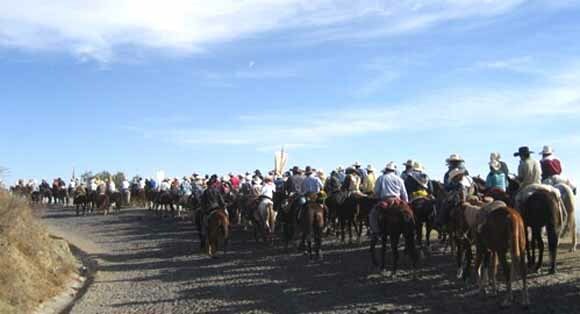 The photos below were taken from the 52nd and 53rd annual cabalgatas in 2007 and 2008. The pilgrim carries a large candle in his hand during the entire trip. At the end of the two-day ride, the pilgrims catch a glimpse of the statue of Christ the King. Some still wear the traditional Mexican sombrero and tilma.